Problem - Currently the code is adding new contact but not merging it into existing contact based on Phone number. Is there anything I have to do before adding the contact? 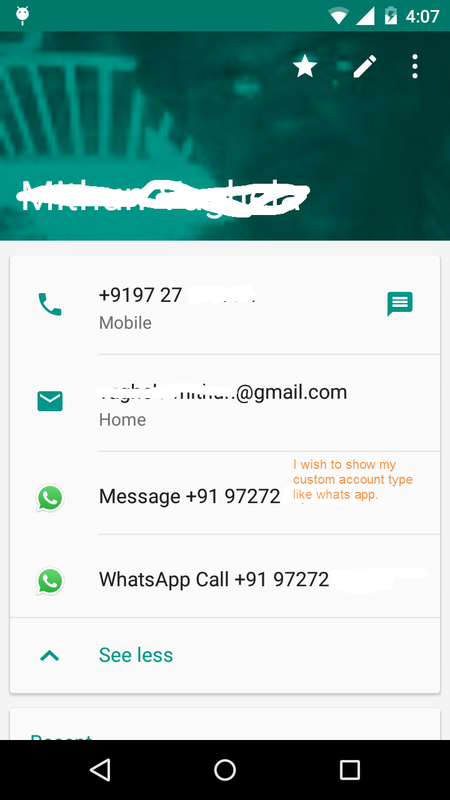 I would like to display my app account inside Contact same as Whats App. I have implemented SyncService, SyncAdapter, Authenticator, contacts.xml and other classes required for the project. The only thing not working is showing contact inside the default Contact app instead of creating new contact. I had the same problem on Android 6.1 and as I heard, this issue is present since Lollipop. Every implementation on the web shows that the contact matching should work based on phone number. And it works on earlier systems - I tried it on KitKat and it works like a charm. But since Android 5.0 contacts don't match somehow. I left the phoneNumber in case the contact doesn't have any displayname - then it would at least match on earlier Android versions. Not the answer you're looking for? Browse other questions tagged android android-contacts contactscontract or ask your own question.